TAKE ON your drive with all energy, no exhaust. Wake up fully charged, and get where you're going with swift power out of the gate. Change course: Take the scenic route, and go farther with confidence. Embrace the future in Canada's bestselling fully electric vehicle. Now with a newly standard, longer range than ever. 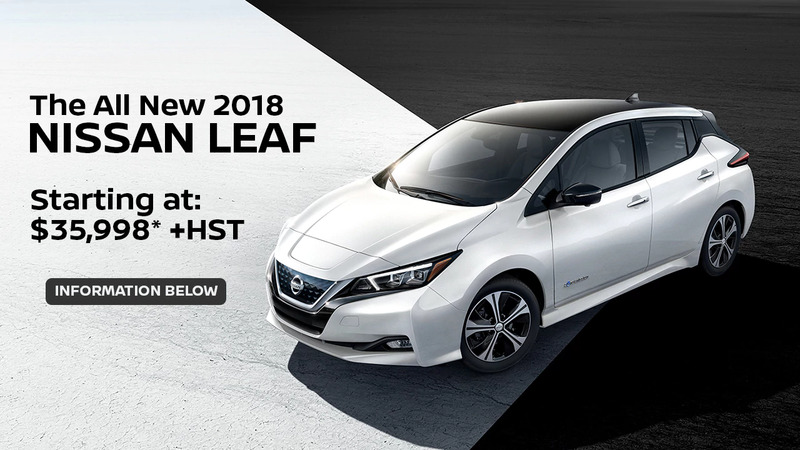 The 2018 Nissan LEAF.® It's time to enjoy AN ELECTRIFYING RIDE. The Nissan LEAF gets up to 172 kilometers range with its 30 kWh battery. How does it achieve these remarkable numbers? With a 100% electric drive system powered by an advanced rechargeable lithium-ion battery, and nine range-maximizing features that help you go farther on every charge. With the convenience of your own home charging station, you can plug in your Nissan LEAF® overnight - just like you would with your cell phone - and you'll be all set for the start of a new day. 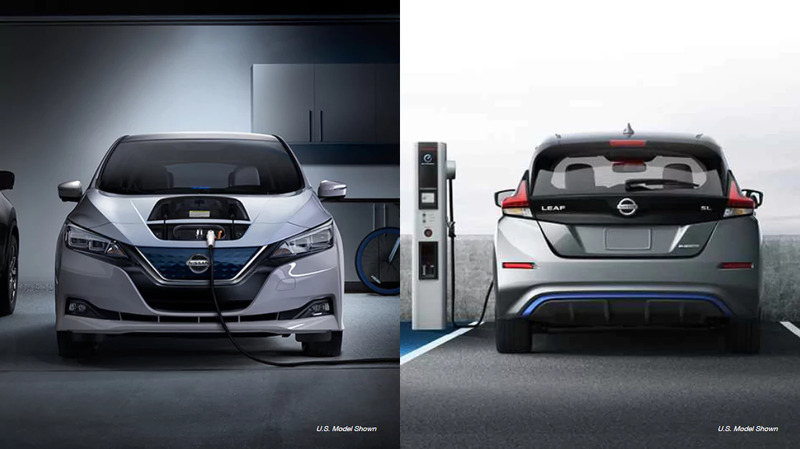 And with Nissan LEAF® NissanConnect℠ EV, you can easily find public charging stations on your route, when you need to recharge on-the-go. 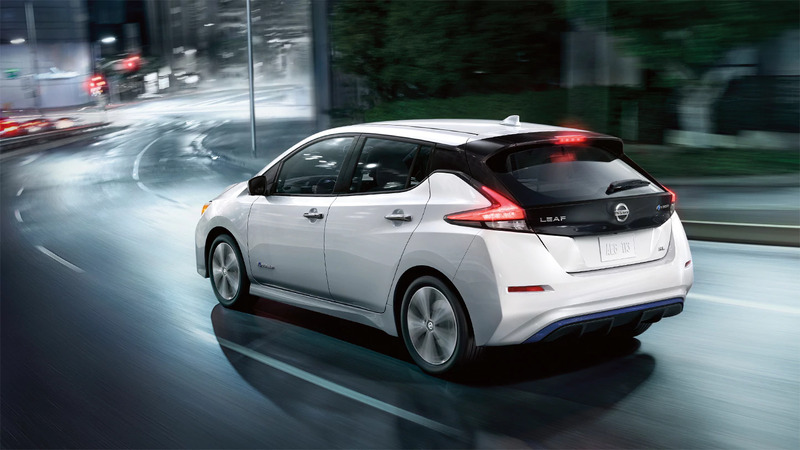 From the moment you hear its signature power-up chime, you're in for a blast behind the wheel of the Nissan LEAF. 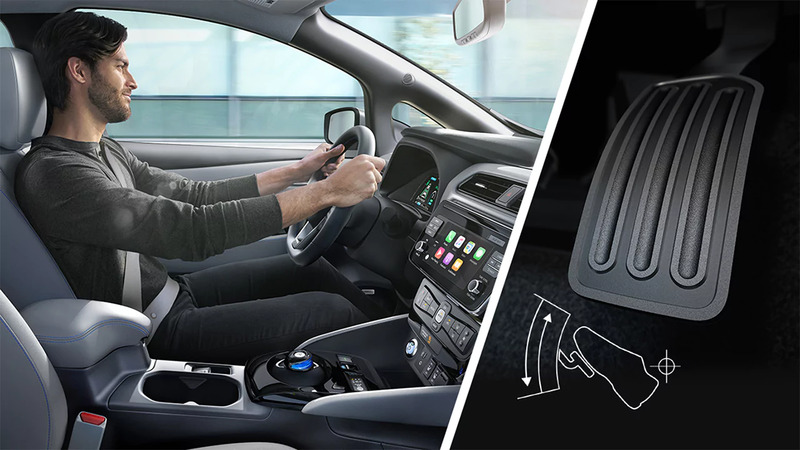 An available heated, leather-wrapped steering wheel will help keep your hands warm on chilly mornings. Ultra-modern gauges and an easy-to-read Display Drive Computer puts information like range, battery charge level, and power usage info front and center. Fun that's efficient. Practical that's cool. The best of all worlds, all in one car. 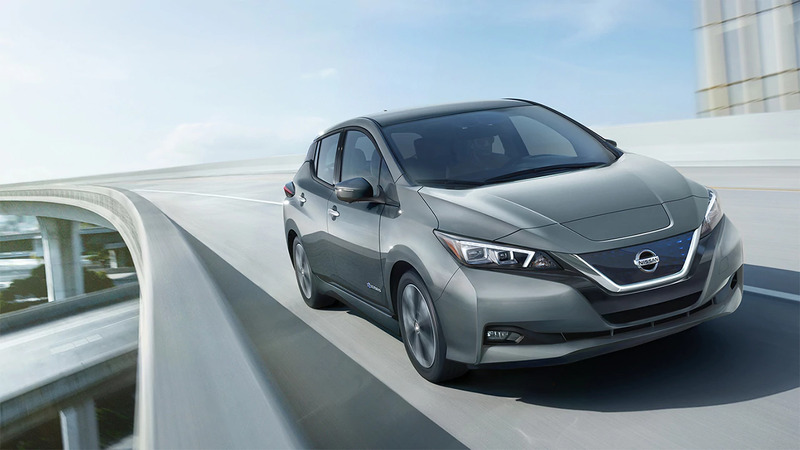 As exhilarating to look at as it is to drive, LEAF features sharp lines, a dynamic front end with a unique multidimensional translucent blue grille, and a signature "floating" roof. LEAF makes it easy to find the nearest charging station, charge at off-peak hours, and keep tabs on the vehicle from your compatible smartphone. Everything you need to keep the journey going. Charge your LEAF on a timer, bring your vehicle to the perfect temperature before you even get in, and get up-to-date traffic reports from your compatible phone. Staying in touch with your world and your LEAF is easier than ever. 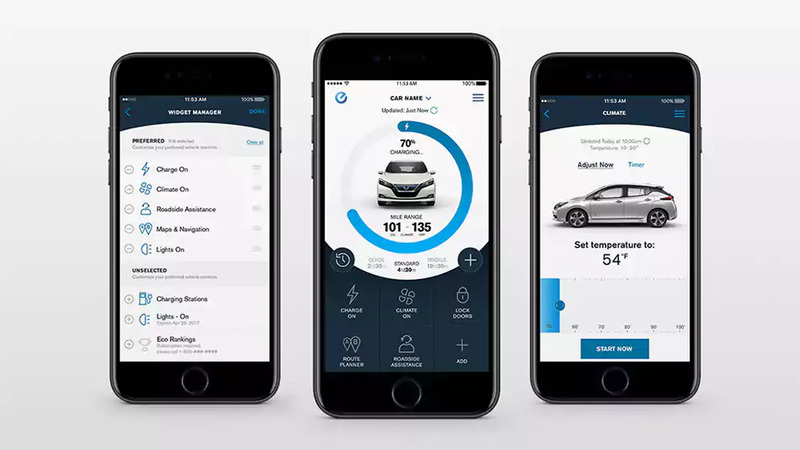 From a customizable, digital instrument cluster to a "floating" information screen to seamless mobile integration, it's all here. 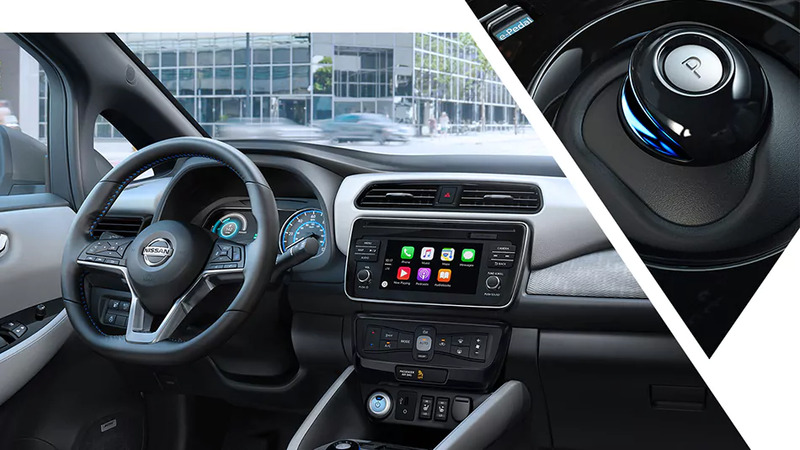 Get access to your compatible smartphone with Apple CarPlay, Android Auto, a USB port, and Bluetooth technology. It's never been easier to connect to your world. You free up an awful lot of room when you take out things like transmissions, oil filters, and radiators. With the 60/40 split rear seats up, you can fit in three child seats, and still have space for your golf bag in back. Fold them flat, and you'll have a generous 30 cubic feet of versatility - including a handy cargo well that lets you keep valuables out of sight.